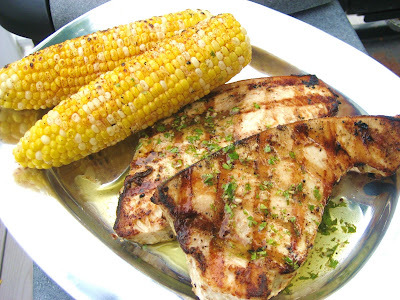 Grilled Swordfish with salsa di Giovanna. 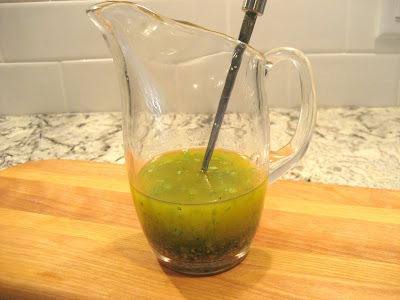 Giovanna sauce is really just a vinaigrette, but in addition to the olive oil, lemon juice, salt and pepper and garlic, I added fresh cilantro from the garden to give it a real fresh taste. This makes a wonderful sauce to drizzle over grilled fish, especially a thick swordfish steak. Serve with my Grilled Corn on The Cob and you have a delicious meal. 1. Mix oil, cilantro and garlic in a medium sized bowl. Whisk in the lemon juice, salt and pepper to taste into the oil mixture. 2. Prepare the swordfish for the hot grill: season the fish with salt and pepper and brush a coating of mayonnaise on both sides. This seals in the fish and you wont' know it's there after it's done. This is a restaurant trick. Grill the fish on a medium high heat for about 3-4 minutes on each side depending on the thickness. 3. When the fish is done, move to a platter and drizzle the sauce over the fish and serve the rest of the sauce on the side. My version of salsa di Giovanna made with cilantro.